Forty Four Percent: The Problem with Polysemy: Communicating when words don't matter. The Problem with Polysemy: Communicating when words don't matter. Misunderstandings are a natural part of communication. They are to be expected, planned for, accepted, and dealt with as proactive an approach as possible. What I am going to be writing about today is a particular kind of misunderstanding; a misunderstanding that derives from the very nature of the communication process, and the weaknesses intrinsic within it. This type of misunderstanding is, as the title of this entry suggests, polysemy. Polysemy is quite literally “multiple meanings”. In more specific terms it relates to the capacity of a sign – a physical embodiment that is used to represent a concept, such as a word, a sound, a symbol, or so forth – to have multiple referents – these are essentially the actual meaning or concept, for example an actual cat as opposed to the word “cat” (which is a sign). In terms of the overall communication process, shown below, polysemy takes place in the decoding of a sign. A sender encodes a referent in to a sign, which is then decoded back in to a referent by the receiver. The process of encoding is mostly unimportant to what we are discussing today – although we will return to it later. What we are focused on is the process of decoding. 1) Signs are arbitrary. With the possible exception of onomatopoeia or visual representations – where the sign and the referent are closely linked by the very fact that the sign embodies some aspect the referent – there is no particular reason why a cat is called a cat, or why a red octagon means stop, or why the word nice means something pleasant. 3) Signs have no inherent meaning. Try as you might as a sender of a message you cannot imbue it with an inherent meaning. If, dear reader, you are suspicious of my point, allow me to expand with a couple of examples. If a sign could have an inherent meaning then wordplay could not exist, as the receiver would always interpret the sign in the way that the sender intended (puns are made possible through polysemy, after all). In a more extreme example, if a sign could have an inherent meaning we would not have to learn language, as language is merely an agreed upon series of signs and their associated referents; if the sign carried inherent meaning it would be capable of being decoded regardless of whether or not there was an agreed upon sign-referent association. These work in combination to reinforce what I have touched upon before: what I say and what you hear are fundamentally different things. More importantly in terms of polysemy what I hear, what you hear, and what a third person would hear, are again all fundamentally different things. The diagram below demonstrates this. Adapted from Puntoni, S., Schroeder, J. E., & Ritson, M. (2010). Meaning matters: Polysemy in advertising. Journal of Advertising, 39(2), 51-64. This is why I consider it so important that when communicating you focus on what you want heard rather than what you want to say. This is why I consider it so important to attempt to communicate empathetically: to put yourself in the shoes of your intended audience to understand the manner in which they decode information so that you can create encoded messages that minimise the opportunity for misunderstanding. 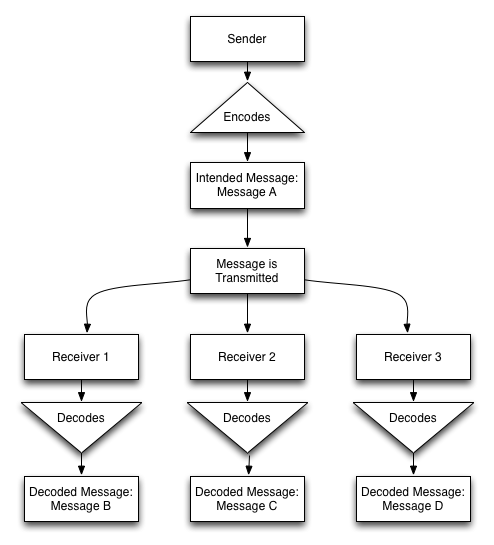 It is not up to the receiver to decode the message “correctly” so much as it is up to the sender to ensure that it is encoded so that it will be decoded as it is intended. Or if not decoded as it is intended, as close to as intended as possible. Now, the discussion that typically prompts my desire to descend in to an explanation of polysemy revolves around offensive language, but I don’t particularly want to litter my burgeoning blog with a whole lot of awful words. However I will say that a word cannot be inherently offensive, or bad, but rather that a person’s interpretation of that sign might associate it with a particularly hurtful referent. This is why it is so important to communicate conscientiously; to be aware of how your words can and will be decoded by others, and to have the empathy required to avoid the usage of language that may be harmless to you but that may have a harmful referent for others. You can encode ‘lame’ in any number of ways that do not involve harming others, similarly ‘foolish’, and so on. Say what you mean. That being said, language is not a static object, and the shared understanding does change over time; what one day means ignorant or lascivious may, through changing the context of usage, come to mean pleasant, as is the case with the word ‘nice’. So with that out of the way I have another example to discuss the manner in which being unaware of the dangers of polysemy can be potentially hazardous to wanting to get your message across. The example I have chosen is a recent one, and one where I ended up having some rather long and drawn out discussions in an attempt to explain this issue: Occupy Wall Street. More specifically I am going to explore the trend at the beginning of this movement to consciously avoid explaining their message in depth. Again, I won’t go in to political allegiances and so forth, but say that this is intended mostly as an example that should be salient for most people. Simply put: at the beginning of OWS, when asked why they were protesting, a typical response was that they were protesting in response to “economic injustice” or “unfair taxes” or something similar. This is problematic. This is perhaps something of an oversimplification of the positions – again, political discourse is not the goal here – but the fact that the three positions are each quite different is quite important. More important is the fact that each of these groups is in full agreement with the assertion that there is economic injustice, yet would arguably disagree with one-another on the actual meaning of the message and how to take action against it. 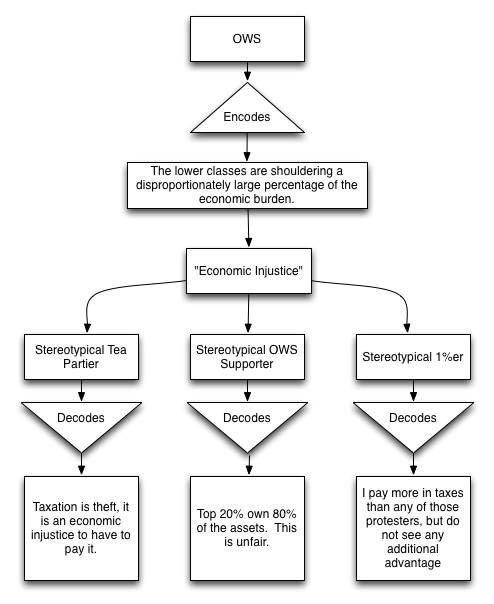 To focus on “economic injustice” as a central issue, yet to resist defining what that actually means to you, is to engage in extraordinarily poor communication; particularly if it means being in agreement with those you actually oppose. Harmful to dialogue, and harmful to the attempt to actually get the message out. This is why we must be so cautious of agreeing with those who refuse to define terms. If they do not explain what their meaning is – the referent that underpins their sign – we may end up agreeing based purely on our subjective meaning rather than what is actually being discussed. We are in essence agreeing with ourselves. Communication is fundamentally about shared understanding and therefore cannot be achieved without both sides making their positions known with as little ambiguity as possible. 1) Focus on what you want to be heard. Communicate empathetically. 2) Avoid signs that are likely to be decoded incorrectly. 3) Say what you mean. Minimise ambiguity through clear definition. Unless you want to deceive people, in which case just do the opposite of what I suggest and you should be golden. But that would be kind of a jerk move.